If you are a regular eM Client Calendar user, you might already be familiar with some of its calendar views – but do you know them all? The Month view is perfect for organizing events spanning multiple days or for looking at the bigger picture when you usually have only about 3 or 4 events per day. The Week view is tailored for those of you who regularly have more than 4 events per day or prefer to see more details about individual events without having to open them in a separate window. The Work Week view will only display the days that you have selected as your work week. By default, it is set to display Monday to Friday, but you can change the settings in Menu > Tools >Settings > Calendar > General. The Day view layout is almost identical to the Work Week one. Because it only displays a single day, there is more space to see detailed event descriptions or even multiple events side by side. There is also the Agenda view, which gives you a chronological list of all events with the option of hiding the ones that are already in the past. eM Client also offers a special Composite view. 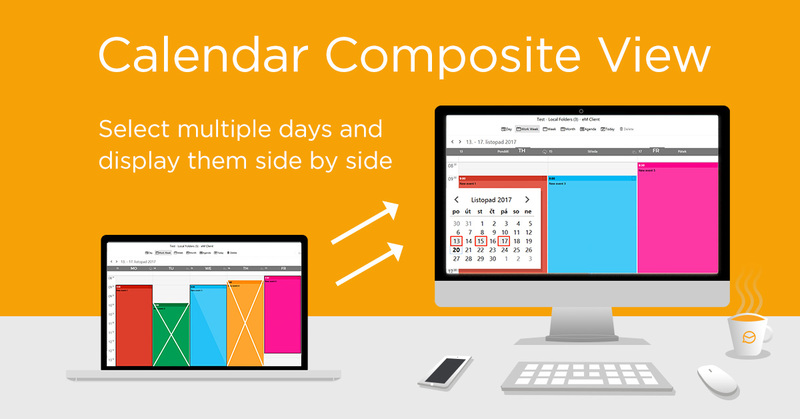 This view allows you to select multiple days and display them side by side – those days do not have to be consecutive but can be separated by any amount of time. Let’s say you need to see crucial days from this month, and only those days, as well as some days from the next month – that’s where the Composite view comes in. You can activate this view by holding Ctrl and clicking on the days you want to see in the small calendar located under your calendar accounts. The same applies to deselecting days as well: just hold Ctrl and deselect one of the highlighted days to remove it from your view. Follow our blog for more tips on getting the most out of your eM Client! You can also follow us on Facebook or Twitter to find the latest information about new releases.